You could caption that! There's so much going on. I can't stop starring at it. Thanks for stoping by my moment it was lovely to be directed here. Wonderful! So amazing :) Thanks for sharing! WOW! 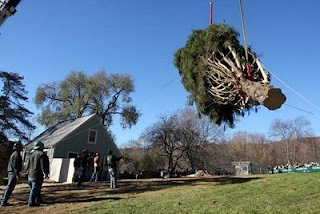 that's a HUGE tree to be moving! Oh my! What a moment! Wow yesss I said the same. What a moment !!! Wow, I wonder what the tree was thinking? Great shot. Thanks for sharing it. Katie.